Prototype: Austrian Federal Railways (OBB) class 1018.101 express locomotive. Rebuilt locomotive constructed between 1950 and 1952 from the former locomotives with road numbers E 18 046 and E 18 206 that were damaged in the war. Model: The locomotive has an mfx digital decoder. It also has controlled Softdrive Sine high-efficiency propulsion and a compact design, maintenance-free motor. 2 axles powered. Traction tires. The engineer's cabs and the engine room have interior details. The metal grab irons and other details are separately applied. The locomotive has finely detailed running gear with a prototypical reproduction of the quill-drive wheels. The triple headlights will work in conventional operation and can be controlled digitally. Length over the buffers 19.5 cm / 7-11/16". An appropriate collector's display case made of wood and glass, with a reproduction of a photograph of the prototype on the background is included. 7-part edition for 150 Years of Marklin. Appropriate collector's display case for each model in the edition included. 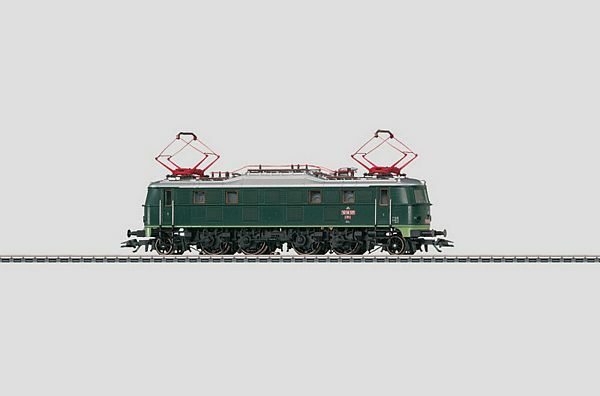 This model is part of the 7-piece Marklin H0 special edition for the 150th Anniversary of Marklin and represents one of the main markets for our company history with its rich tradition. The image of the display case is only a suggestion of what the final product may look like.